Shadow Kitty is the full Silhouette of a cat mounted on a base. The shape of the base is the shape of a cat's eye. Oak . When a light is shined on the sculpture(ex.from a lamp), the shadow shows on the wall behind the Kitty. It is fragile because the thickness of the wood is very thin. The Shadow Kitty has been carefully hand cut with a scroll saw. Each section is cut separately by stopping the saw and taking the saw blade out of the saw and inserting the blade into a new area of the wood. A tiny hole must be drilled into that individual section of the wood first, then the blade can be inserted into that hole to start the cutting of that area or section of the piece. After all the cutting is done each area must have all the edges carefully hand sanded and rounded. This can be made from Walnut, Oak, Purple Heart, or Babinga woods. 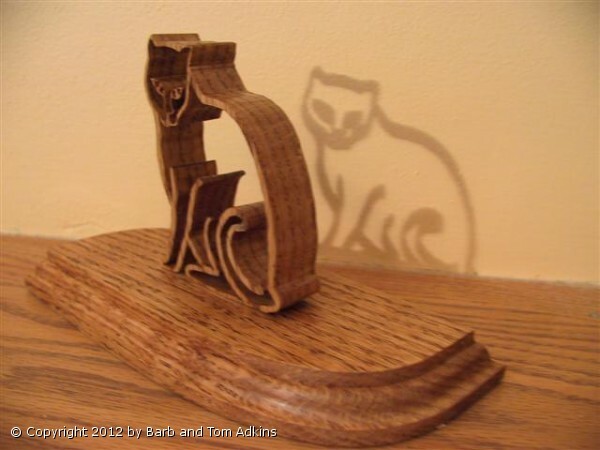 Shadow Kitty may be custom ordered out of the kind of wood you like best.